We had a great show again last night. It wasn't the 13th show, but it was on the 13th... but no technical issues surfaced (yay). 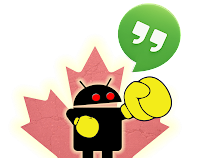 And if you haven't already watched it, you're missing out... we detailed the TRYLGG4 contest and gave our thoughts and opinions on other topics that are relevant to the average Canadian Android user. Check out the show and consider subscribing to us on Youtube! As always, thanks to the loyal group who's always there on the chat to keep us on our toes!